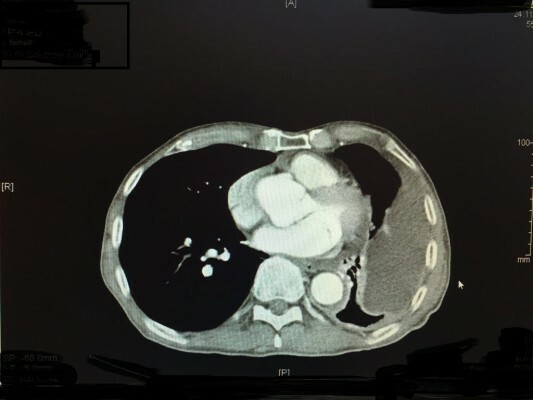 Introduction: Therapy of malignant pleural mesothelioma and especially the adequate role of surgery in this context remain the subject of controversial discussions. Radical surgery in particular, which is associated with substantial morbidity, failed to translate into a definite survival advantage. We report on interim results of an ongoing Phase II study of regional chemotherapy in terms of isolated thoracic perfusion with chemofiltration (ITP-F). Patients and methods: Twenty-eight patients (25 male, 3 female, mean age 63.4 years) with advanced pleural mesothelioma were included in this study. Isolation of the chest was achieved by insertion of a venous and arterial stop-flow balloon catheter via a femoral access. The aorta and inferior vena cava were blocked at the level of the diaphragm and the upper arms were blocked by pneumatic cuffs. Chemotherapy, consisting of 60 mg/m² cisplatin and 15 mg/m² mitoxantrone, was administered directly into the aorta. The isolated circuit was maintained for 15 minutes followed by ~45 minutes of chemofiltration with a hemoprocessor until 5 L of filtrate were reached. The endpoints of the study were overall survival and quality of life (QoL). Results: Out of 28 patients enrolled in the study, 5 had prior surgeries, 10 patients had systemic chemotherapy, and 5 patients additional irradiation. In all patients in restaging, clinical progress was noted. In all, 162 cycles were administered. Due to chemofiltration, toxicity was within tolerable limits, revealing World Health Organization grade I leucopenia and thrombocytopenia in 9 patients and mucositis grade I in 6 patients. The major surgical complication was inguinal lymphatic fistula in 40% of the cases. Gastrointestinal toxicity and/or neurotoxicity were never observed. One-year survival was 49%, 2-year and 3-year survival was 31%, and 5-year survival was 18%. Median overall survival was 12 months and progression-free survival 9 months. Conclusion: ITP-F for patients with advanced pleural mesothelioma, progressive after standard therapies, is an effective and well-tolerated treatment modality, offering comparably long survival data at a good QoL.